Fit your entire group onto a tiny platform. This will require creative thinking and a comfort with the rest of your team. Once you think you’ve got it, you may find that they platform has become even smaller than you initially thought! 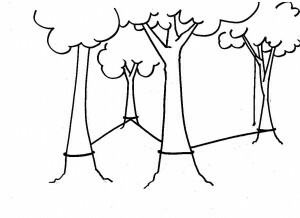 This challenge, in which your team has a valuable liquid that they must safely transfer across an imaginary ravine without spilling a drop, will push participants to evaluate their strengths in relation to the group while forming a successful strategy. 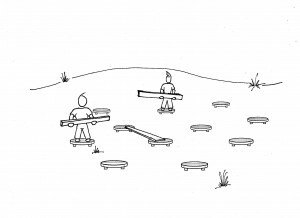 Your team must evacuate everyone to safety by creating and supporting bridges between a series of platforms. 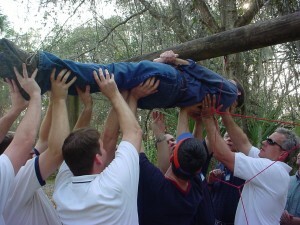 Teams must plan ahead to avoid leaving anyone marooned. Find balance with your teammates… literally! The Whale Watch is a massive teeter-totter. 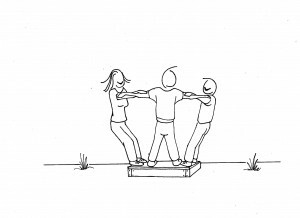 The entire group must enter the platform and put it into perfect balance with both ends off the ground and keep it there for 30 seconds. During this unique challenge, the group must pass themselves through a giant web without touching any part of it, lest we wake up the giant spider. 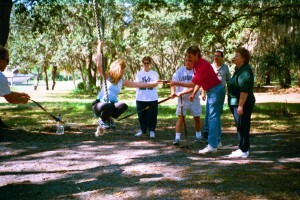 Participants must learn to trust and be trustworthy to carefully move everyone to the other side. A series of small posts laid out in a ZigZag. Several differently sized boards. 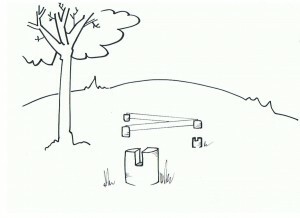 Each board will create a bridge between the posts, but which boards go between which posts? Who has the strength to move the boards? Who has the agility to walk across the narrow beams? Who will create a plan to get the group across the posts to the far side? This challenge is a good progression from Islands. This test of co-operation requires an entire team to move perfectly in sync. 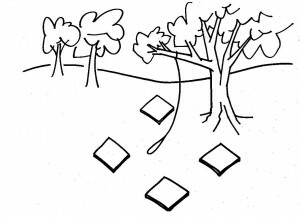 There are many variations on this element, but all revolve around a single theme: the group can only move when they are in perfect communication with each other. A single person out of sync can bring the entire group to ruin. Traverse a series of low steel cables without touching the ground. 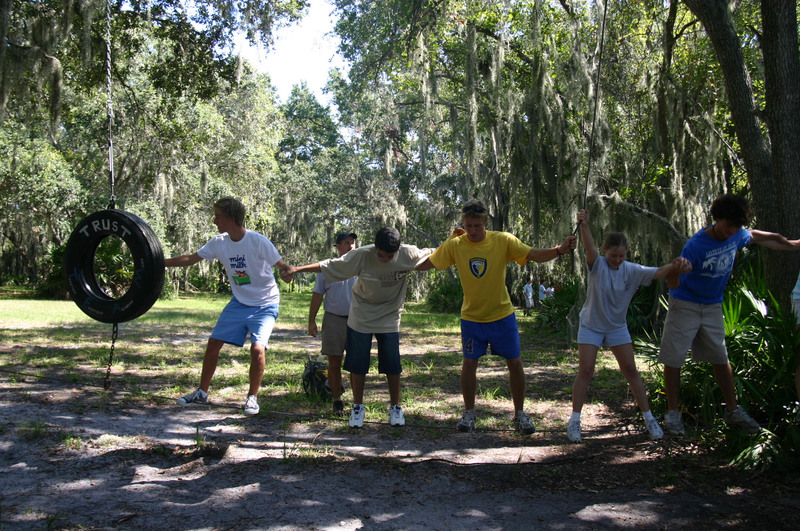 On some sections of cable, your group will have hanging ropes or long tethered ropes to use for support. On other sections, the group will not be able to use anything but each other for balance. Two steel cables strung in a “V” shape. Two members of the group step onto the cables at the peak of the “V”. Each person stands on their own cable. 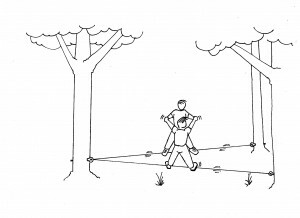 While using each other, and only each other, for support the pair attempts to move as far down the “V” as possible while the cables get farther and farther apart. Successful teams learn that you can achieve far more when you lean on your partner (giving) rather than pulling on them (taking). This challenge is the ultimate progression from Islands and ZigZag. A series of tiny islands spread out in a seemingly random pattern. One platform is the entry platform and another is the exit. 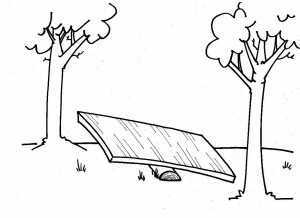 Several boards of even length are provided to the group to use as bridges, but the bridges will not span between all islands. The group must find the correct route from the start to the end, but it is not as simple as it seems! There is no complete route that can be made by simply laying boards from one island to the next, truly creative thinking is required. Our facilitators will choose from these, and many other challenges, to create a custom tailored program that addresses your groups needs. For more information on this process, visit our Custom Tailored Challenges page. 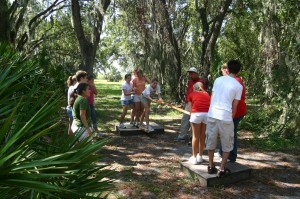 During each of these challenges participants have the opportunity to learn valuable lessons through their experience. For more information on how we ensure that all of our participants walk away with real lessons, please visit our Ensuring Comprehension page. 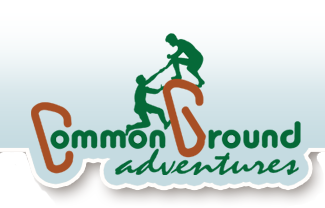 Fill out our Program Pricing Request Form online and we’ll send you a pricing estimate for your Low Challenge Team Building Program.